The Royal Canadian Mint has issued the newest release in its extremely popular $20 for $20 series. 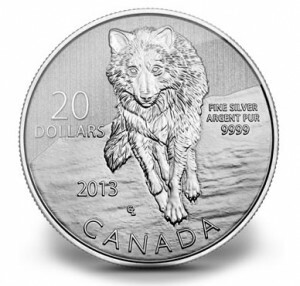 Available now, although likely to sell-out in short order, are the 2013 $20 Wolf Fine Silver Coins. These coins are struck from 99.99% pure silver. Featured on the reverse of the strike is a design showcasing a running wolf amidst its natural Canadian habitat. Canadian artist Glen Loates created the wolf design which features the creature with a head-on view. Surrounding the wolf are the inscriptions of CANADA, 2013, 20 DOLLARS, FINE SILVER ARGENT PUR 9999 and the artist's initials of GL. The obverse of the coin contains Susanna Blunt's effigy of Queen Elizabeth II. The portrait is surrounded by the inscriptions of ELIZABETH II and D G REGINA. This strike is offered as the eighth release of the Royal Canadian Mint's $20 for $20 series. As the name of the series indicates, the coin features a $20 face value and is sold to the public at that face value. All previous coins of the series attained a sell-out status. The only exception is the 2013 Hockey Coin which was only released in January. It will likely achieve a sell-out itself within just days as the Royal Canadian Mint indicates 97% of the mintage have been ordered. As for the mintage of the $20 Wolf Silver Coin, it has been established at 250,000. Each coin is presented in a clear sleeve attached to an illustrated card which also includes the specifications of the coin and a certificate of authenticity. Those interested in obtaining the $20 for $20 Wolf Silver Coin may do so directly from the Royal Canadian Mint, while supplies last. Orders are accepted on the website of www.mint.ca or by calling the Customer Solution Center at 1-800-267-1871 (Canada), 1-800-268-6468 (US) or (613) 954-2626 (International). Whee!!! Beautiful coin for nature lover’s .But it’s disheartening to know that it’s likely to be a sell-out in short order only. I must decide on buying it in a jiffy to gift it to my son. Don’t want to be left disappointed!